"Commodore Hopkins, Commandeur en Chef der Amri. Flotte.," Thomas Hart, 1781, Anne S.K. Brown Military Collection. Esek Hopkins is an interesting figure. 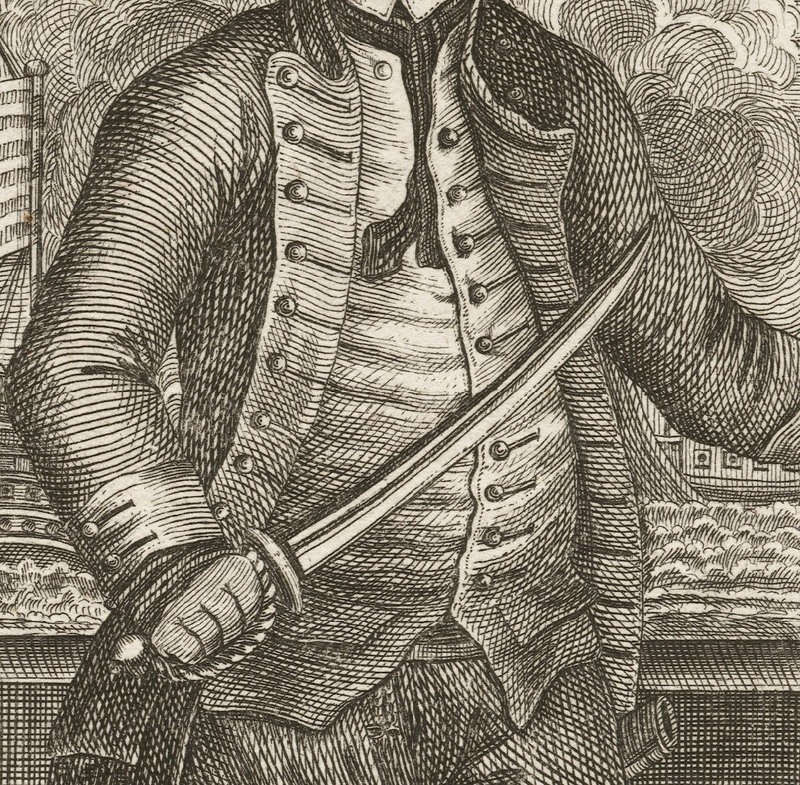 A successful merchant captain before the war, Hopkins was also an adept privateer during the French and Indian War. Given his past experience, it is not surprising that Congress granted him command of the first American naval squadron. 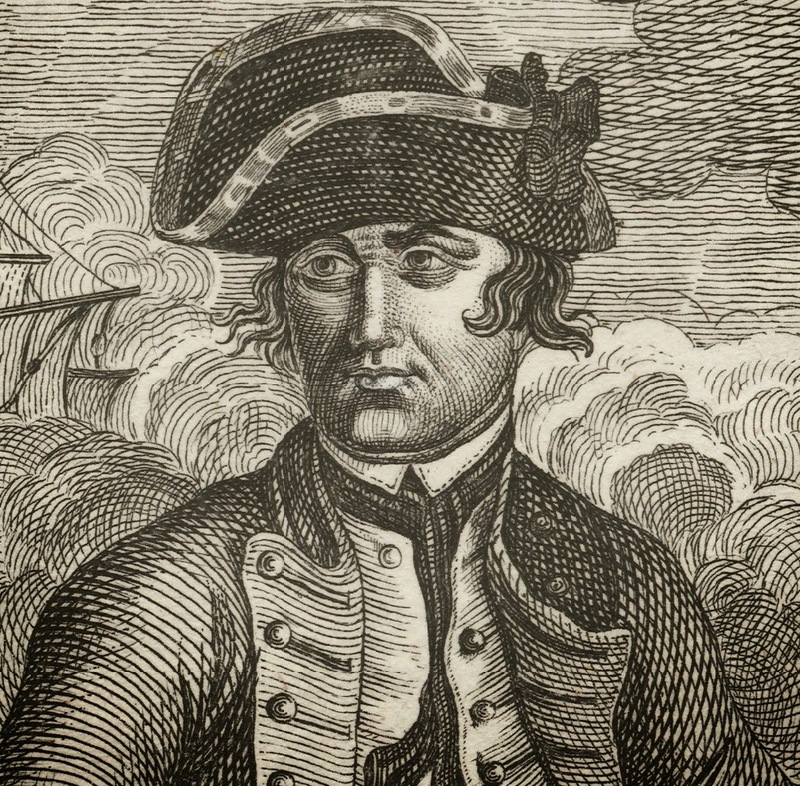 He led the successful invasion of Nassau, but was humiliated when the 20 gun Glasgow outmaneuvered his seven warships, disabling two Continental Navy vessels. The fight was so disorganized that the Continentals hit each other in the fray. Hopkins was later censured by Congress for his failure to follow orders, which may not have been all that realistic anyway. 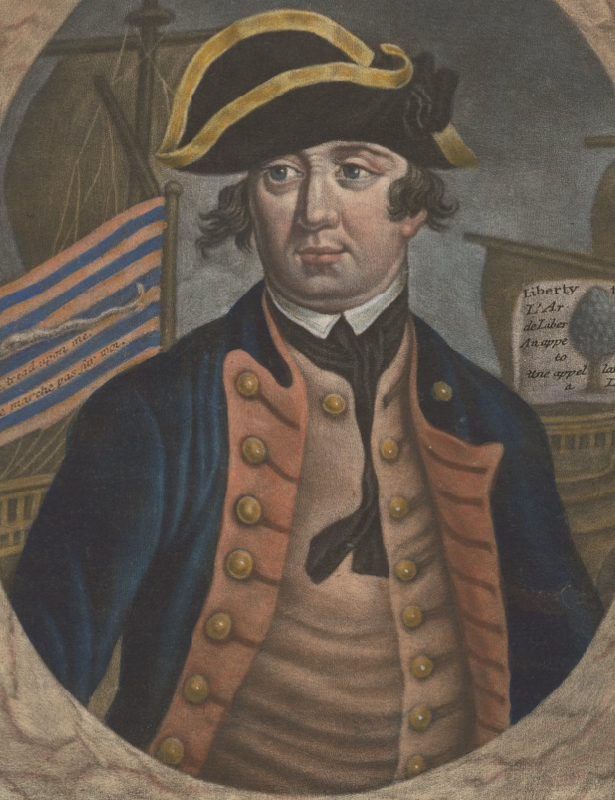 The rest of his naval career was spent blockaded by a British squadron, and he was removed from command in 1778. Thomas Hart printed two renditions of Commodore Hopkins, one was a colorized bust in an oval frame, the other this piece. Both are based off of a portrait done by Wilkinson. The 1781 version has a less crowded background and is closer to a full body image. You can see the earlier colorized version (which incorrectly identifies its subject as "admiral") here. Hopkins wears a cocked hat turned over his left eye, lined with silk tape and bearing a large cockade. His shirt collar is folded just above the black cravat at his neck, which peeks out of the plain single breasted waistcoat with its domed buttons. His coat is without collar and fitted with evenly spaced plain domed buttons down his lapels. The lapel on his right side is buttoned to the coat, but his left is unbuttoned. His waistcoat has flap pockets at the waist. Plain dark breeches of the same hue as his jacket finish off his uniform, if it may be so called. 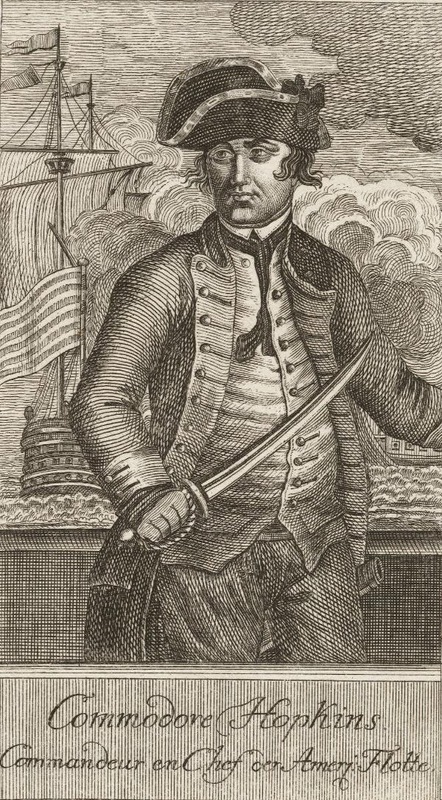 Hopkins' pose and uniform match that of the 1776 piece by Wilkinson. We can probably apply the color of the uniform from this piece to the print: a dark blue jacket with light red lapels and brass buttons that match those on his pale red waistcoat. His hat is lined in gold tape, and the bow appears to be silk.